With the election less than two weeks away, anti-hospital activist Jim Horn is running for election to the Palm Drive District Health Board on the shocking platform of ending the dedicated parcel tax subsidy to the Sonoma West Medical Center (SWMC), selling or leasing the building to the highest bidder, and forcing the hospital, with its life saving emergency room, to close. Two highly qualified and better informed candidates are running against Horn on a platform of working to support and sustain a thriving, reopened hospital with an emergency room that a few years ago, was voted by Consumer Reports to be the safest of more than 350 hospitals in the entire state of California. Palm Drive Health Care Foundation Chair Gail Thomas is running with Rob Cary, the volunteer project manager who oversaw the complex reopening of the hospital, as the only two of five candidates who are committed to keeping the hospital open. During the 2014 District Board election, a grassroots uprising against West Sonoma County’s powerful political insiders elected the “Doc and Cop,” who won a resounding victory and a new District Board majority that acted to reopen the hospital that the previous board had irresponsibly forced to close. Jim Horn and fellow candidate Eira Klich-Heartt are promoting the duplicitous argument that the Board should sell the building to the highest bidder and grab parcel tax dollars legally earmarked by voters for the hospital and its emergency room and reallocate them to other non-emergency health services run by their friends at West County Health Centers. Lately Horn is saying that he does not want to close the struggling hospital, which has in recent months moved closer to sustainability under the Pipeline Management group. Horn says that he just wants to remove the $1 million subsidy it currently receives, and make the hospital pay the District Board millions of dollars per year that it does not have, as the market rate that the building would be worth to a private corporation that did not operate a hospital. Given the economic challenges of even breaking even with a tax subsidy earmarked for that purpose, even without paying rent, this would be impossible to achieve, as Jim Horn knows. Jim Horn is employing the same political doublespeak that he did when he ran unsuccessfully two years ago: he plans to kill the hospital without saying that he wants to kill the hospital. In the view of Jim Horn and of fellow candidate Eira Klich-Heartt, the District should “get out of the hospital business,” while continuing to collect the parcel tax. What they don’t seem to realize is that supporting the hospital is not merely one option among many. The stated purpose of the parcel tax, and the purpose of the District Board itself, is very specific: to make sure that we have a hospital and emergency services in West County. It shocks many in our community that anyone would run for a public District Heath Board that was specifically established about 15 years ago to support a hospital and its emergency room on a platform of closing that hospital and siphoning off those tax dollars to fund other services. This illicit tax grab is especially suspect in that it comes at a time when there is an acute shortage of emergency room beds in Sonoma County, due to a cutback in emergency room beds at Santa Rosa’s new Sutter Hospital from 120 to 80, and a growing population in our county. This important report by the University of California at San Francisco, titled, “Higher Chance of Hospital Death Found in Areas Where Emergency Departments Have Closed,” found that the odds of dying increased 15% for heart attacks and 10% for those with strokes and 8% for sepsis. West County residents will have to pay the same amount in parcel taxes whether the hospital and its emergency room stays open or closes. 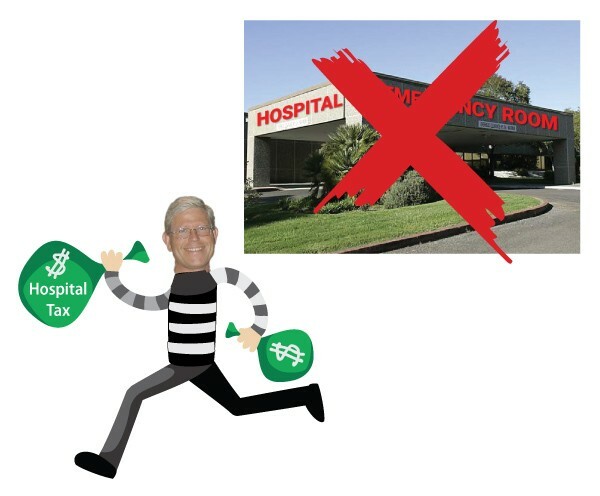 Taxpayers save zero dollars by selling the building and closing the hospital. Many of us, especially the eldest, sickest, and those with infants and small children, will suffer, and some will die as a result of needing to go to Santa Rosa for emergency room care. Just $1 million, or less than 10% of the $16 million spent during the costly reopening and operating of the new SWMC hospital has come from our tax dollars. More than 90% of this cost has come from private philanthropy. More than 2/3 of this money has gone not to operating losses, but to upgrading the facility and licensing costs associated with reopening after the irresponsible decision to close Palm Drive Hospital was made by the former District Health Care Board majority (which the Doc and the Cop replaced two years ago). Public hospitals like SWMC and Palm Drive never break even without public subsidies. A small community hospital that must, by law, provide emergency health care to anyone who walks through the door, regardless of ability to pay, and then wait months for reimbursement from insurance companies and government bureaucracies. This is not a lucrative business, even with the best management. Counties like San Francisco and New York spend hundreds of millions subsidizing their hospitals, and nobody runs for office on the platform that they need to close the hospitals and let people die because they are unprofitable. In the absence of a single payer system that compensates hospitals for all billed care, it has been, and will remain a struggle to operate small hospitals in communities like ours. Urgent care, which Jim Horn wants to misappropriate our tax dollars to pay for, will cost more than double the tax allocation than the current hospital receives. More importantly, an urgent care facility cannot accept ambulances or provide any assistance for life-saving emergencies. It is not open 24/7, and in many cases, it does not even provide care to see people who are not already enlisted as patients. Not a single West county doctor endorses Horn or Eira Klichh Heartt. The most prominent doctors in West County endorse Gail Thomas and Rob Cary, including Doctors Bernstein, Bollinger, Campbell, Canova, Davidson, Delgado, Denno, Holmes, Kahl, Luperini, Murphy, Pitzen, Powers, Rosa and Zelk. The Measure W tax passed by voters in 2004 is legally earmarked to support the hospital, not to fund generalized health care by Jim Horn’s allies at West County Health. The measure stated: “To ensure survival of Palm Drive Hospital and access to local emergency, acute care, medical and physician services, and provide for ongoing expenses, repair and improvements to equipment and technology, shall Palm Drive Health Care District repeal its existing tax and levy a special tax of up to $155.00 on each taxable parcel in the District.” State law prevents special taxes from being used for purposes other than they were intended when that tax was passed. This makes the tax grab that would benefit Horn’s allies at West County Health Centers legally questionable.as well as duplicitous, given Horn and Klich-Heartt’s posture that this outcome is more “responsible” than using dedicated funding for keeping open an emergency room. Mary Szecsey, the powerful Executive Director of West County Health Centers, was one of the top endorsers of Jim Horn and his unsuccessful effort to prevent the hospital from reopening on 2014. Unlike the hospital, which, as a standalone community hospital, struggles with notoriously low reimbursement rates from insurers, West County Health Centers runs at a considerable surplus. That’s because as a Federally Qualified Health Care Centers, West County Health Centers receives rates for all the services they provide their enrolled patients that far exceed those that our local private physicians receive for the same patient and same procedure. In addition, although West County Health Centers does an excellent job serving those who have been able to enroll for its services, its clinics only see registered patients, regardless of the urgency of someone’s health needs. Indeed, during a number of times during the past seven years when I, or a local friend, have asked to enroll ourselves or our children at the Sebastopol West County Health Center, we have been told that they are full, are not accepting new patients, and do not have a waiting list. Despite the challenging cost of becoming, as SWMC has, the only community hospital in modern American history to close and then reopen, West County Health Centers has already been given nearly $200,000 of diverted District funds. Retiring Palm Drive District Board members Sondra Bodley (who has been campaigning for Jim Horn) and Marsha Sue Lustig (who is running for reelection this year while also endorsing Horn) spear-headed the diversion of scarce earmarked hospital funds to West County Health Centers last year, as described in this article, for general non-emergency services. Bodley and Lustig are also the two surviving four District Board members who voted in April 2014 to suddenly close the hospital and reject the Palm Drive Foundation’s doctor led plan to keep it open. They engineered the questionable diversion of district tax dollars to West County Health Services in a highly unorthodox manner, as no Request for Proposals was issued, and no other organizations were given the opportunity to put in a proposal to bid for these contracts. Horn, who has, for two years, doggedly criticized the District Board for daring to spend just $1 million a year on the hospital that it was created to fund, has been the the community’s leading advocate for the diversion of parcel taxes to the organization. Of course, neither Bodley, nor Horn, nor Klich-Heartt say this, though that’s the reality underneath their carefully constructed deceptive narrative. Bodley and her powerful political supporters have a different vision for our community in West Sonoma County, one that funnels dedicated parcel tax dollars to the only major general health services provider in the region, West County Health Centers.